Never belabour yourself with creativity. Outsmart yourself by following the fun. Look for the stream that is open. But it just didn't work out. 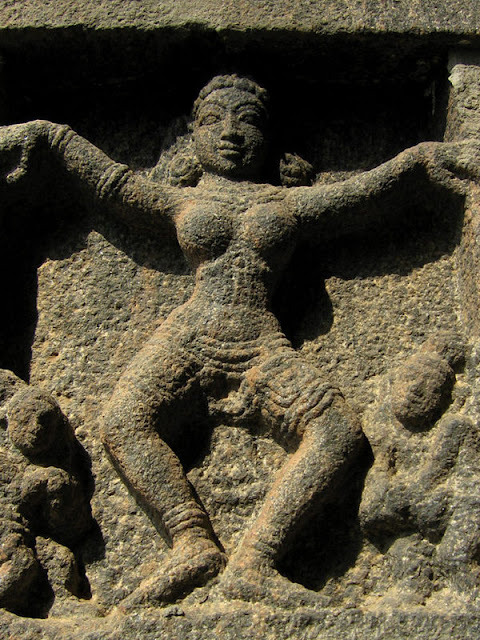 I love these Chidambaram images, and the dance thing is central to my practice and my daily orientation. But I seem to be forcing it now. These images came, after the Discipline of Freedom workshop in May. But they haven't taken off in the way I was hoping for. that it had become too intellectual, too theoretical - that what I needed to do was just to work with the words and the images and see what happened when I put them together (instead of trying to work it out in some way...). Perhaps I'll come back to it more naturally at some point in the future. Perhaps it's medium. I hadn't thought medium could be so powerful. The original dance work was a free kind of painting, but what I did yesterday was heavy, dark charcoal. One part of me was excited by the deep, dark possibilities that seemed to be emerging; all that stuff at the back of my mind and emotions about time, the decay of stone, the life of past sculptors - long dead- coming through time in the form of these weathered, dancing forms. But something about that also started to oppress me. Is it that it's too much about ideas rather than paint/line responses? Or is it that, if I was doing as Paul and Kath suggested - following the fun, looking for the stream that is open - I wouldn't be working with this heavy material right now, however interesting it seems to be to my mind. All images on this site are copyright Tamsin Haggis. Simple theme. Powered by Blogger.